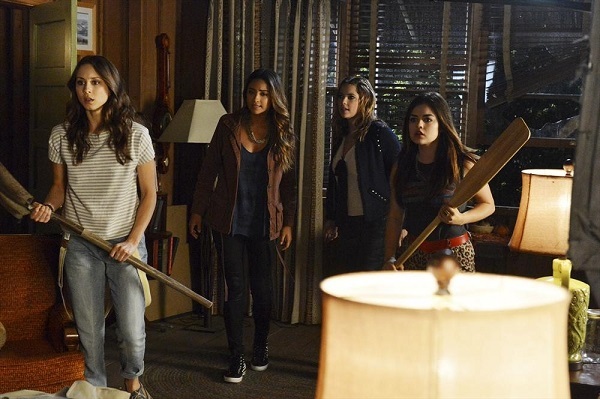 Pretty Little Liars preview: Look out! EzrA is in his cap again! On Jan. 14 it looks like the Liars are heading to Ezra’s love nest in the wood on “Love ShAck, Baby,” and they’re not going to be alone. The photos for the upcoming Pretty Little Liars episode titled “Love ShAck, Baby” aren’t all that revealing, but let’s dig around what’s available to see if we can find any clues in the photos, the promo video, the synopsis and a peek I got at some other videos to determine what might go down. 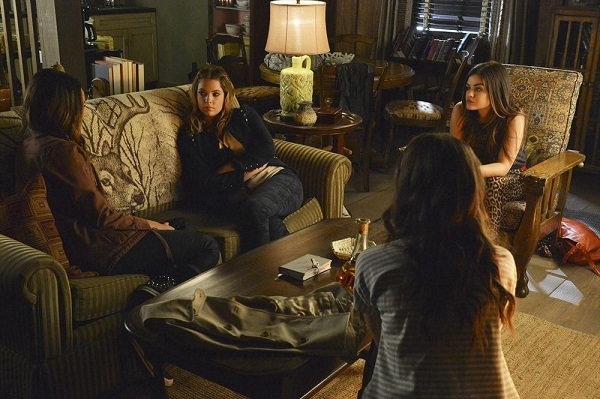 Now that Hanna has shared with Aria, Emily and Spencer that she has Ali’s diary, the girls hope it can shed light on their many questions. But with the diary full of stories that have been coded to cover the truth, each girl must take a turn to figure out which stories are about them. Hopefully, when they are through they will find the story that could finally give them answers to who has been going after Ali. But with each story more personal than the last, do Aria, Emily, Hanna and Spencer really want to admit which story is about them? Yikes, right? We still don’t know if Ezra (Ian Harding) is the ultimate A, but we know he’s on the A team and from the video clip below, that dude is not happy. As soon as he dons the blue windbreaker and his baseball cap, he means business! Personally, I cannot wait to find out about the coded stories in the diary. Leave it to Ali (Sasha Pieterse) to write her diary in code. Did anyone else do that? I did. I knew that little lock wasn’t going to keep my mother’s prying eyes out of it. 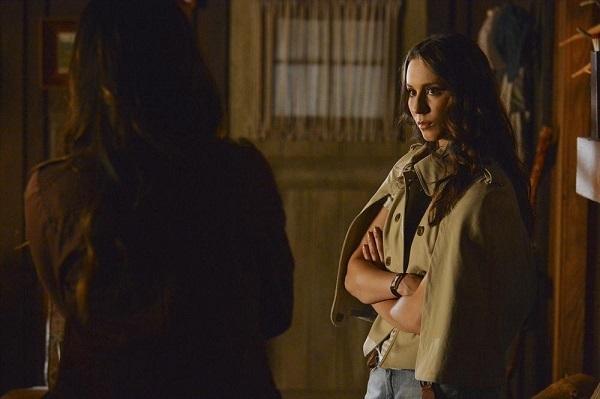 Let’s take a look at a couple photos, because I adore what Spencer (Troian Bellisario) is wearing. Spencer has always really enjoyed sleuthing, but that Sherlock Holmes cape is amazing! Considering the rest of her outfit is just so-so, she really gets a huge shout-out for her fashion choice. That’s fantastic outerwear. Here we see the Liars before they got spooked and picked up a cricket bat and whatever weapon it is that Spencer is holding in the photo up top — a hockey stick? I never took Ezra for the sporty type. Maybe they’re not at his cabin at all. If not, then why call it the Love ShAck? The preview video shows the girls on their desperate search for Ali after the double-dog dare Ali-Ali Oxen-free message on “Who’s in the Box,” and an angry Ezra glowering in the classroom, driving in the rain, dumping the contents of someone’s purse out and playing with his cell phone while pumping gas. Apparently he didn’t listen when warned not to fiddle with electronics next to gasoline. Watch now! Elsewhere within the episode, we’ll learn that Hanna (Ashley Benson) spoke with Caleb (Tyler Blackburn), but doesn’t want to talk to Ashley about it. Spencer thinks Aria (Lucy Hale) is fooling herself into thinking she’s no longer in love with Ezra, but Aria says she’s working on it. Hanna will run into Travis (Luke Kleintank) who’ll have some news about a CeCe Drake spotting. He says the theory is CeCe took money to kill Wilden and she’s on the run. Travis also kindly asks about Hanna and Ashley (Laura Leighton). Are they already setting up a new love interest for Hanna so soon after Caleb’s departure?